Everest. One word is all it takes to conjure images of snow-capped mountain peaks, sherpas skilfully navigating remote mountain pathways, colourful prayer flags floating in the breeze, and incredible vistas that seemingly go on forever. Discover these sights and many more on this incredible 17 day trip to Everest Base Camp - one of the world’s most iconic trekking experiences. Pack your spirit of adventure for this once-in-a-lifetime journey through magical Nepal. Take in the highlights of vibrant Kathmandu, including famous Durbar Square and Boudhanath Stupa, and then fly to Lukla to begin an 11 night trek through the wild trails of the mighty Himalayas. Trek to remote villages such as Namche Bazaar, the Sherpa community of Khumjung, Tengboche Monastery, and on to Everest Base Camp. Situated in the Khumbu region of Nepal, Base Camp is a destination in itself, a mecca for hiking from all across the globe. A number of iconic peaks can be viewed along the trek including Mt. Everest (8848m), Mt Lhotse (8516m), Mt. Nuptse (7855m), Mt. Pumori (7161m) and many, many other spectacular Himalayan mountains. This is a trip that will inspire you, change you, and open your eyes to the beauty that exists all around us. Package includes return international flights, four nights hotel accommodation, 11 nights in mountain lodges during the trek, 37 meals including full board during the trek, and more! Today depart Sydney, Melbourne, *Brisbane, *Adelaide or *Perth for Kathmandu! Fly with airlines such as Singapore Airlines, Virgin Australia, Cathay Pacific and Emirates to name a few. Arrive at Kathmandu airport (1345m above sea level), and be met by a tour representative and transferred to hotel. Please note: due to flight scheduling some flights may depart day 0. Affected customers must be at the airport the night before. Flight times will be indicated on your final documentation which you will receive around 6 weeks prior to departure. After breakfast, enjoy a full day sightseeing tour in Kathmandu. The tour includes a visit to Kathmandu Durbar Square, Monkey Temple, Pashupatinath Temple and Boudhanath Stupa. In the afternoon, return to the hotel where you will have some free time to shop for any trekking gear (in the Thamel area) you need. After an early breakfast at the hotel in Kathmandu, transfer to Kathmandu airport for an early morning scenic flight (approx. 35 minutes) to the small mountain airport of Lukla. After arriving in Lukla, your trekking guide will introduce you to the porters who will assist with carrying your luggage throughout the trek. Afterwards, the trekking will begin, following the mountainside on the left bank of the Dudh Koshi river. Today’s trekking is easy and takes about 3-4 hours to reach Phakding where you will spend the night. After having breakfast at the lodge, start trekking toward Namche Bazaar. The trek follows the Dudh Koshi River which you will cross a few times before stopping in Jorsale for lunch. After lunch, continue through the pines for a few hours before the spectacular views of Namche Bazaar appear ahead. Namche Bazaar (3440m) is surrounded on three sides by mountain ranges and opens out only where it faces the Dudh Koshi. The village is a central hub of the area. Food, drinks and even mountain climbing equipment may be purchased here. The Namche Bazaar is tucked away between two ridges, amidst the giant peaks of the Khumbu and has an abundance of lodges, tea shops and souvenir shops - not to mention a magnificent outlook. It is an ideal place to spend a rest day for acclimatising to the high altitude before heading towards Everest Base Camp. Today to assist in the acclimatisation, you will walk up to Khumjung Village through Everest View Hotel in Syangboche to see a stunning view of the Himalayas including Mt. Everest. The Khumjung is densely populated by the Sherpa community and there is an old monastery which you will visit before returning to the lodge in Namche Bazaar. This morning’s trekking offers excellent panorama views of Thamserku, Kantega, and Kusum Kangrib. After walking a few hours along relatively flat zigzagging paths, we descend to the river and arrive at Phunki Tenga. Afterwards climb through Rhododendron Forest to the Tengboche Monastery. Situated at 3,867m, the monastery is the largest gompa in the Khumbu region of Nepal. Check into the lodge and spend the afternoon looking around the Monastery/area or at leisure. Begin today’s trekking by descending through Rhododendron Forest to the Imja Khola River where you will cross an exciting suspension bridge. Pass by a long Mani stone wall to enter the village of Pangboche before continuing through summer pastures to Dingboche village. Check into the lodge and enjoy your evening at leisure. An important acclimatisation/rest day today with a casual walk where you will witness the breathtaking views of the North face of Ama Dablam and the Lhotse-Nuptse ridge as you explore this beautiful valley that leads up to Island Peak. The walk is short with a good chance to relax in the afternoon. From Dingboche, ascend the small ridge above the Pheriche valley. From the stupa at the top, Taweche and Cholatse (6440m) make for a pretty striking scene; they seem to lean forwards from across the valley in the west. To the north, Lobuje Peak (6119m) and the snowfields of the Cho La are the kings of the skyline. The walking will now be fairly flat on wide-open fields. Late in the morning you will cross the Khumbu Khola at Dughla and take a light lunch at the foot of the huge terminal moraines of the Khumbu Glacier flowing off Everest. In the afternoon, there will be a solid and quite steep climb on a rocky trail to the top of the moraines. On the crest of the ridge, you’ll pass a line of memorial cairns (stacks of stones), built in memory of the Sherpas and climbers who have died on various Everest expeditions over the last fifty or so years. From here the view is downright spectacular once again, with Pumori (7145m), Lingtren (6697m), Khumbutse (6623m), and across the border in Tibet, Changtse (7550m) surrounding you. Then follow the valley stream to the lodge at Lobuche, arriving early afternoon. 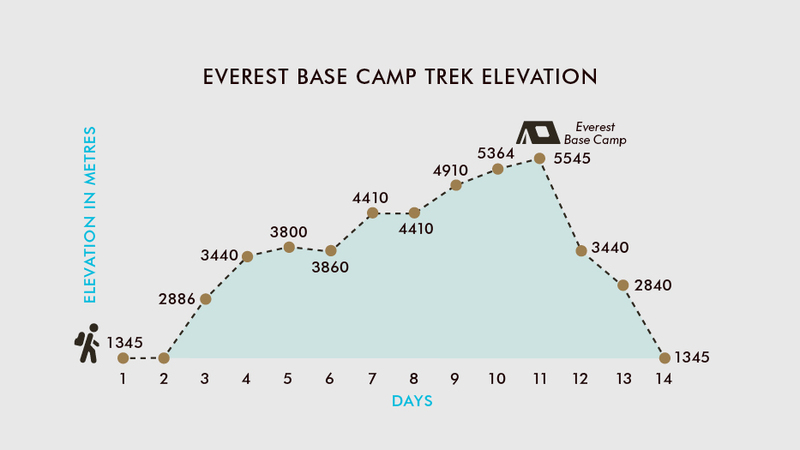 The day you’ve been waiting for – the legendary Everest Base Camp. From Lobuche, follow the broad valley that runs parallel to Khumbu Glacier. When you reach the moraines of Changri Nup Glacier, you will make a series of small ascents and descents over a rocky trail lined with cairns that eventually leads to the surprising glacial sands of Gorak Shep (5160m) – reached after about three hours of walking. Here you have lunch and leave all your belongings at the lodge where you’ll stay tonight. Now’s the time to head to Everest Base Camp! The trek to base camp takes around three hours. From base camp you won’t get views of Mount Everest, however you will be able to see glaciers, caves, lakes and what’s regarded as technically the most dangerous and hardest section to climb Everest, the Everest Ice Fall that flows from the Western Cwm. Trek back to the lodge in Gorak Shep for an early night - tomorrow morning is one to remember. Rise early this morning to avoid the morning clouds as we climb to Kala Patthar peak (5545m.) to witness the best views of Everest. These panoramic views of Mt. Everest at sunrise are truly incredible. You will also be able to see a number of iconic Himalayan mountain peaks like Mt. Pumori, Mt. Lingtren, Mt. Khumbetse, Mt. Nuptse, Mt. Lhotse, Mt. Ama Dablam, Mt. Thamserku and many more. The ascent is quite steep, so start very slowly and try to ascend at a steady rhythmic pace. Kala Patar is the rocky hilltop below Pumori. It’s a tough walk because of the altitude, but the view from the top will surpass your wildest imagination. Hike back around one hour to Gorak Shep to enjoy breakfast, pack your bags and set off to Lobuche and Thugla, where you will stop for lunch. Then you’ll cross the Khumbu Khola and head down the valley below Cholatse to Pheriche, where you will stop for the night. Today is a tough walking day however it’s all downhill from here. After having breakfast at the lodge, start trekking back towards Namche Bazaar. Today’s trekking is at an easier descent passing through Rhododendron Forest before reaching Tengboche for lunch. Tengboche is a small village with a famous monastery offering you the splendid view of Ama Dablam, green hills and river views. After lunch trek back to Namche to spend the night at the lodge. Leaving Namche, descend through the forest towards the Dudh Kosi for our last day of the trek, and continue the return journey re-crossing the river a number of times. Retracing your steps along the valley, pass through a variety of settlements and forests before a gentle 45-minute climb to Lukla. Savour the final mountain sunset of the trek as you complete this exhilarating journey of the highest mountain range in the world. Tonight is a great chance to enjoy a few celebratory drinks with the rest of the crew before flying back to Kathmandu in the morning. Have an early breakfast before walking to Lukla Airport to board the flight back to Kathmandu. Transfer to the hotel and spend the rest of the day at leisure. Today is yours to spend at leisure in the beautiful city of Kathmandu. Today transfer to the airport for your flight back to Australia after ticking off a truly spectacular bucket-list experience. Travel offer is valid for travel on selected dates until the 4th of December 2020. - All lodges have beds with linen and indoor bathrooms. Hot water is available on request. A hot shower is an additional cost of approx $2.50 - $5AUD at the Mountain Lodges. Please note some lodges do not provide towels so packing a towel is necessary. - Accommodation/rooms offered are based on a lead-in room type, and are subject to availability based on seasonality. Properties will be confirmed, no later than two weeks prior to travel. 3-5 star hotels will be used in cities and on the trek locally owned comfortable lodges will be used. As the lodges are locally owned the money goes back into the local community - giving back to people of Nepal. - Kathmandu - 3 Star option (Pre/Post Tour): $95 per room. - Kathmandu - 5 Star option (Pre/Post Tour): $205 per room. Twin or Double (subject to availability). Minimum group size 2, maximum group size 14 per vehicle. 37 meals are included in the tour, for all other meals; lunches and dinners the tour leader (when available) will offer assistance with reservations, suggestions and directions to local restaurants. It is your responsibility to notify TripADeal of any dietary requests/requirements. Please note; we will do our best to meet your requests/requirements, however cannot guarantee that we will always be able to. Your main luggage will be carried by porters on trek and you simply carry a daypack with a water bottle, camera, sun-screen, spare jacket etc during the trek, as small loads allows for full enjoyment of the trek. A trek bag is ideal for your main luggage, plus a small lockable bag for travel clothes or anything that you do not need during the trek which you can leave at hotel’s locker room/safe deposit box in Kathmandu free of charge. Weight allowance for Nepal’s domestic airlines is 15 Kg including your hand bag; excess weight is chargeable at USD 1 or more which is payable on our tour. A porter is provided for each 2 trekkers and a porter can carry about 20 Kg (10 Kg from each trekker). Please note: a moderate-strong level of fitness will be required with daily trekking from between 3 hours to 8 hours. You will reach an altitude of 5,545m above sea level. If you have any concerns please consult your healthcare provider prior to purchase/travel. Electricity is available in some of the villages on the Everest base camp trek where you can re-charge your camera batteries, and there is solar power in some villages that you will trek through. We suggest you bring spare batteries, and be prepared to pay a small fee to charge electronic items. The Twin Otter Plane is the only of transport to and from Lukla for this tour. Occasionally, flights to and from Lukla may be cancelled due to unpredictable mountain weather conditions. We have kept one extra free day at the end of the tour to use in the case of a flight delay or cancellation. If the flights are cancelled for 2 or more days, we will charter a helicopter to ensure you are on scheduled flight to your home or other destination. The cost of this extra service is payable directly to our office in Kathmandu in US cash, or credit cards (Visa Cards, Master Cards only). A receipt of payment will be provided from which you can claim from your insurance. The minimum cost will be US$500 and maximum US$3500 depending on the number of people. In case of a serious sickness or injury while you are on Everest base camp trek, we will do everything to transfer you to the nearest hospital. You will be entirely liable for all the expenses incurred in the evacuation/rescue, so, please make sure that these expenses are covered by your insurance policy before departure. - Toiletry kit and be sure to include toilet paper stored in a plastic bag, hand wipes, and liquid hand sanitizer, towel, soap, etc. Gratuities (tips) are not included in the tour price for services of the tour leader (when available) and driver throughout the tour. The recommended tip is $5 per person for the city guided tour and $10 per person per day for each day on the trek. This will amount to a total of $120AUD for the trek which will cover your guide and porter. A Tourist Visa for Nepal is required if travelling on an Australian Passport. This can be arranged on arrival for approximately $40 USD, valid for 30 days. Visas must be arranged in USD currency at the border with 2 passport sized photos.